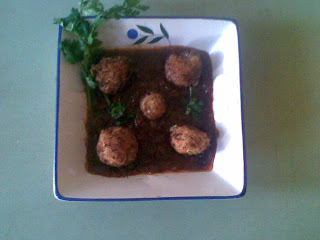 The actual name is "Manchurian Balls with Gravy" but if I post with that title Omantel may block me! Who knows! 4. Deep fry these coftas until crispy and golden brown. 3. Add soya sauce, Ajinomoto, tomato sauce, chili paste, ginger garlic paste and chili sauce. 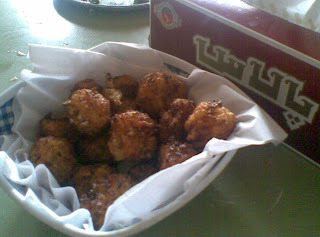 Pour the sauce over the Manchurian Coftas just before serving. 2. I am far too lazy to blend chili paste and garlic paste separately so I made Chili-Ginger-Garlic paste. Do NOT use the pastes available in the market! They are not good in taste. 4. I added chopped corriander leaves to my sauce to make it more aromatic. I am on a low-fat,low-carb, low-sodium diet from last one month - It has been well over month that I ate anything tasty! I like Chinese food but no one eats in my family so I called on my neighbor (who loves Chinese food but no one eats Chinese in her family too ) Mrs. Joshi. In fact she was the one who gave this recipe! Mrs. Joshi is our neighbor from last 7 years, she is like a member of our family. 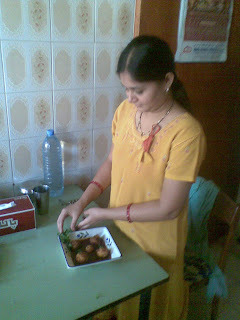 (yep, Gujarati & very good cook) She came to help me out! 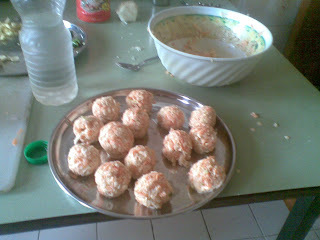 She and I had fun cooking this recipe. So thanks Mrs.Joshi! Ciao,sono ripassato per salutare te e i tuoi lettori.Hello, I went to greet you and your readers.Ho letto che dormi poco,ma se è cosi' vuol dire che il tuo corpo non vuole dormire di piu'.I read that little sleep, but if you so 'means that your body does not want to sleep more'.Un grosso abbraccio ed un saluto dall'Italia ,Eugenio.A big hug and a greeting from Italy, Eugenio.